Two years ago, Deron and Becca Smith took Ida Bozonoona and her husband Richard to Silver Dollar City in Branson, Mo., and they enjoyed it very much, except Ida nearly “died for a second” when she went upside down. She said never again will she ride that roller coaster that turns upside down. “It will be my child (who rides it),” Ida said. We’ve really enjoyed staying the night and eating several meals with Richard and Ida. Visiting their place is a highlight of our trip, and they do a great job of giving our children lots of Ugandan experiences such as making chapatis, roast corn and chicken, peeling matooke, and walking through the village smelling coffee blossoms and seeing all the crops including sugar cane, yams, bananas, coffee, and corn. Richard loved riding the roller coaster as much as he enjoyed listening to his wife’s story in this video. Notice Ida’s holding Rubel on her back with a wrap, and Ruben is holding corn and wearing some cute little slippers. What you’re going to see in this video is the power of working together. A group of Ugandans dug a 15 foot pit for a latrine but never used it. When we broke tools trying to break through lava rock, we decided after 2 days to explore using that pit. We began 15 feet down and immediately progressed quickly to 25 feet, then 45 feet the next day. You’ll hear Roy Mwesigwa talking about what we’re going to do next, and that was typical of the way we worked for six days together, muddling through, sharing opinions, sometimes too many, and we had to just take one of our ideas and run with it. You’ll also see a local woman scooping the wet sand/clay mix and she she said she wanted to smear it on her hut. You’ll see my son, Jacob, showing how his hands have chalky white soil on them from the composition of the soil we were extracting, and you’ll see 3 *real* men down in the hole working hard. One of these guys, James Okumu, was the oldest on the well drilling site. How far do we drill? Here is the next video showing the last stage of drilling where we find sandy sludge, a sign of water below. Here is a rewarding but subjective stage where you wonder how far to drill below. To understand how much water is in the hole at this point, use a string and weight to measure the top of the water (static level) to the bottom of the hole. We were getting 3-5 feet measurements of water and could audibly hear water when we dropped small rocks. Next, I’ll post the casing work on the well. Our family ate and slept homes of Ugandans, and watching the way water is used and fetched particularly gave us more understanding of the importance of good clean water. We’ve all carried water for a little distance but we’re not as good at carrying on our heads! Ida and Richard Bozonoona hosted us in their home for several meals and to sleep one night. We watched them get water from their catchment system, water from down the hill, across the street, bottled water. We have loaned Richard and his son, Rogers, some tools to start exploring for water on their property. They are digging with the auger to find how far they can reach before hitting rock or water. We have really enjoyed being in the homes of our Ugandan friends and we also stayed with Bobby and Candice Garner, who have been here for two years working with The Kibo Group. Some donors from Garnett Church gave some money for children’s projects in addition to the water projects. Some of this money for children has gone toward a literacy/library program at the Source of Life Cafe and Resource Center. This is a cool place where Ugandans and “Bazungu” (white people) come to do internet, drink great coffee and eat snacks. Computer courses are offered, and right now a BBS (Basoga Bible School) advanced course is being offered on Luke-Acts by Professor Ken Neller from Harding University in Searcy, Arkansas. Many cool things continue here in Uganda, and we’ve been very happy to catch up with friends, work on the water well project, and show our children the place where they were born and grew up. We’ve witnessed baptisms in Lake Victoria, seen natual wildlife, birds, and enjoyed one of the best climates in the world. We’ve also enjoyed foods we’ve enjoyed over the years, like chapatis, white sweet potatoes, fried cassava, and whole fried tilapia. Our first visit to Buwembe village where we drilled the water well was three days, then we visited two more times for a total of six days working on the water well. Google map search “Busia, Uganda” and you might find where we are. I don’t know if Buwembe would be on Google maps. Drilling a water well by hand is hard. We made a lot of mistakes. When I was cutting pipe for the screen at the bottom of the well casing, I dropped the pipe and cracked it. We broke pipe at a joint. Some of these are not really mistakes but just stuff that happens on drilling sites. The first time we pumped water, we realized we’d put a check valve on backwards. We had to pull all the pipe back out. On the sixth day we sank the 4 inch casing, the 1.5 inch casing and .75 inch “rod” that carries the water. I can’t upload the video right now because I’m using Bobby Garner’s computer and it takes a couple hours to upload, so I’ll do that later. But I want you to see the looks on faces and happiness when the pump brought up the water. The biggest thing is that we learned together. More than 50 people had their hands and hearts into this project. 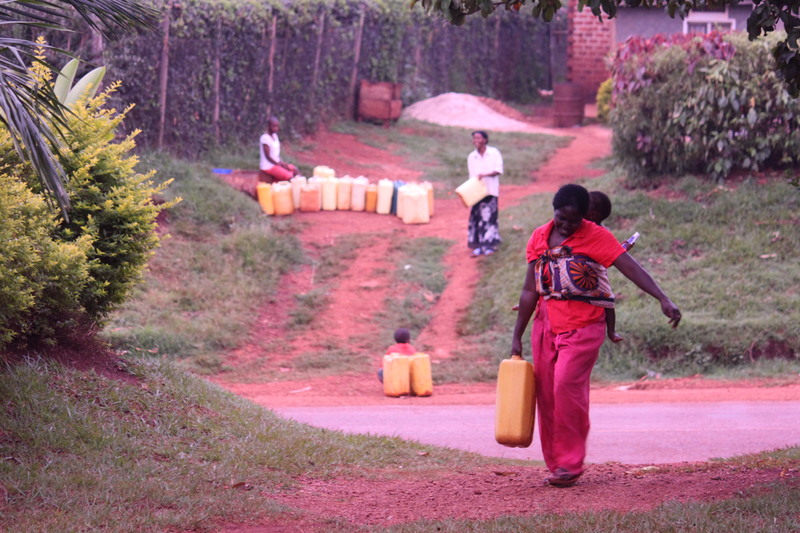 Children who carry water 1-2 kilometers were anxiously watching this closer well produce water.